For more information, call 855-740-1130 or contact FreedomPACS online for a demo. Premier MRI/CT provides outpatient diagnostic imaging services (CT, MRI, MRA, X-ray) for the tri-county area in the metropolitan Detroit community. With multiple locations, Premier MRI/CT focuses on top technology, high quality and quick, flexible service, which often includes same-day or next-day availability. Founded nearly a decade ago, Premier MRI/CT serves many thousands of patients each year, including completing over 3,500 MRI studies annually. Before FreedomPACS, Premier and their near 500 ordering physicians were experiencing a high level of frustration and critical loss of time, money and productivity relying on medical image CDs. “With so many locations geographically, moving around physical records was problematic. It was impractical for the amount of volume we have and the number of patients we see,” said Gary Wood, director of Premier MRI/CT. “We needed to be able to get X-rays, MRI studies and CT images in the hands of the doctors in a more convenient way,” he explained. Digitalize their images and studies. Provide secure, web-based access to their ordering physicians. Meet current security and privacy regulations. Premier MRI/CT found all that and more with FreedomPACS. 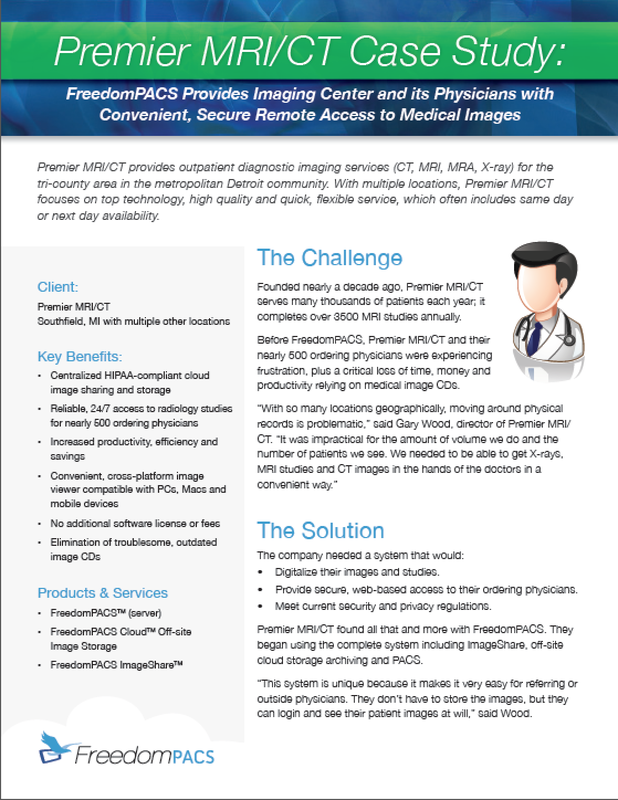 The imaging centers began using the complete system including ImageShare, off-site cloud storage archiving and PACS. “This system is unique because it makes it very easy for referring or outside physicians. They don’t have to store the images, but they can login and see their patient images at will,” said Wood. For Premier MRI/CT, FreedomPACS ImageShare enables external physicians to access critical images quickly with little hassle. “FreedomPACS is much easier, less frustrating to outside doctors, and more affordable than the image sharing solutions I used during my 28 years on the hospital side of radiology,” said Wood. “Because this is a web-based system using a regular browser, referring and outside physicians don’t need a software license to login and see the image shared with them,” he explains. FreedomPACS removes geographical limitations and helps Premier MRI/CT to serve their patients and physicians better. “With FreedomPACS, we are able to operate an imaging center that has multiple sites and manage our images so that they are readily accessible, secure and backed up,” he explained. “FreedomPACS also enables us to archive our images across multiple sites—efficiently, inexpensively and with quick access to images regardless of where our doctors might be located. ImageShare is a great benefit as it allows us to connect our external physicians securely so that they can see their patients’ exams,” said Wood. FreedomPACS (http://www.freedompacs.net) is a cost-effective medical picture archiving and communication system (PACS) that provides convenient access and archiving of radiology images from multiple modalities. 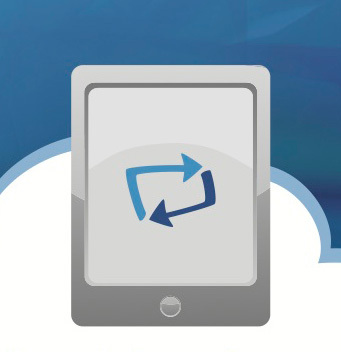 Using cloud or server technology, it incorporates DICOM standards and is accessible on Windows, Mac, iPad and Android. FreedomPACS Cloud (http://www.freedompacs.net/cloud) offers secure, HIPAA-compliant off-site storage for radiology images. Available with or without a PACS, this affordably priced solution harnesses the protection and efficiency of the cloud. It provides instant access and an optional cross-platform diagnostic viewer. FreedomPACS ImageShare (http://www.freedompacs.net/imageshare) is a convenient and secure way to share in-house medical images and radiology studies with out-of-network parties through an online HIPAA-compliant channel. FreedomPACS is owned by MN Systems, headquartered in Southfield, MI, a joint venture between a medical software development company and a group of practicing physicians. MN Systems brings technology and medical expertise to its customers, combining software development knowledge and physician experience to provide affordable, efficient and leading-edge medical software solutions to ultimately improve patient care.